There are often times that I wish I had more time for dolls. The moments when I work a lot in a week, or work mostly nights, results in very little time to devote to the dolls in my life. I wish that was different, but such is life when you exclusively do shift work and often get called for nights. The moments that I get to spend with my dolls is precious because it’s time that I spend relaxing and enjoying my hobbies. My off-work time is generally for non-work purposes, I try not to think about work or do work related things (which is at times easier said than done). But the moments that I get are often so far and few between, but I still greatly enjoy it because it’s my hobby time! 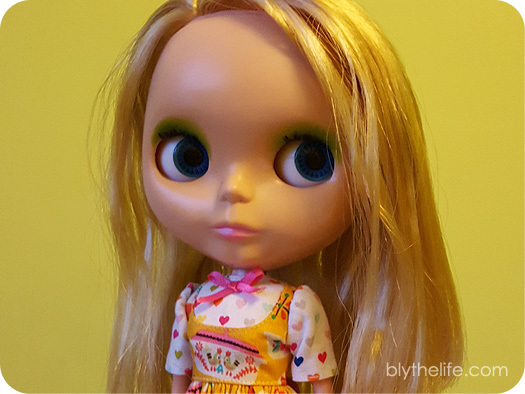 QOTW: Have you had moments of no dolly time? That dress suits her so well! I totally know what you mean about not having enough dolly time. I work days but I still hardly ever have time on weekday evenings to do doll stuff. There are household chores to be done, time to spend with my husband and dogs, and of course meals to make and eat. So many things!